Despite the notice, the city hasn’t gotten the message. Photo by Eric Arnold. 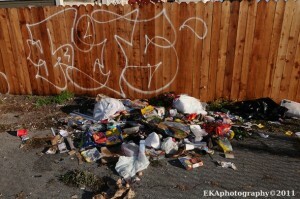 Blight is a major problem in urban environments like Oakland. Homes and lots which fall into disrepair, either from neglect or as a result of foreclosures, can become defenseless targets for vandalism, squatting, and dumping. This can lead directly to drug dealing, prostitution and violence. Blighted areas negatively impact property values and lower the self-esteem of community residents. Holistic Clean-Up should include new art as well. Photo by Eric Arnold. Blight in and of itself is bad enough. But longstanding problems surrounding the city’s much-maligned Building Services department—which include a noncompetitive bidding process for city contracts, exorbitant fees charged to property owners, and little to no community oversight or involvement in the process—only make matters worse. A recent grand jury investigation of Building Services has spurred Oakland City Administrator Deanna Santana to convene a task force to outline recommended reforms, which city officials promise will result in a more “holistic” approach. 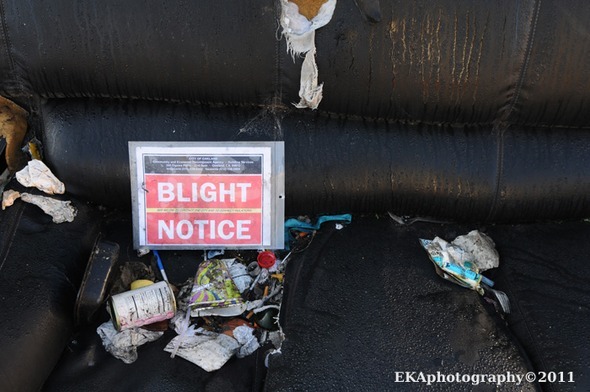 This lot remained a dumping ground for at least two years despite notices from the city. Photo by Eric Arnold. The Community Rejuvenation Project commends the city of Oakland for stating its intent to reform the beleaguered department. However, it is questionable whether any bureaucratic entity can effectively institute a holistic approach without considerable input from community organizations and cultural practitioners. The appearance of unattractive tags on poorly-maintained, vacant or foreclosed buildings is a gateway to more serious forms of blight. Graffiti abatement, therefore, should be seen as a preventative measure and the first step in a overall blight reduction strategy. However, the city of Oakland’s current abatement process is flawed. The strategy of hiring clean-up crews to buff, or paint over tags, is more band-aid than permanent fix; it is only a matter of time before the tags return — requiring additional labor and expense. Community murals are far more effective deterrents to recurring vandalism. Photo by Eric Arnold. There are other, less costly, alternatives. 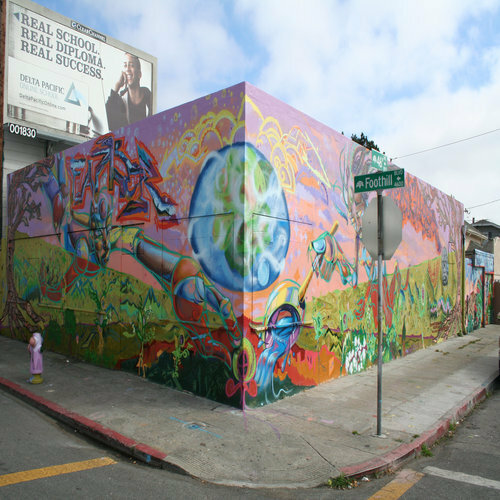 Over the past five years, CRP and its community partners have successfully transformed numerous blighted neighborhoods throughout Oakland into vibrant mural districts at a fraction of the cost the city has paid for abatement. In that time, we have developed techniques and practices for maximum visual and cultural impact, cost-effectiveness, sustainability, and community engagement, which could easily be implemented on a larger scale throughout the city. A truly holistic approach to blight reduction would entail more permanent, economically efficient solutions, combined with youth development, education, and antiviolence programs, while incorporating eco-sustainable, community-oriented components. 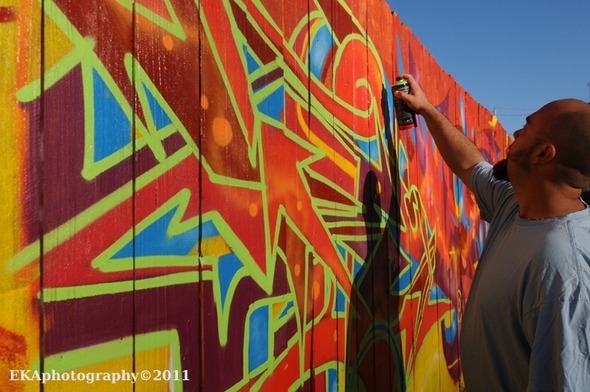 CRP incorporates community clean-up with murals to transform the most blighted areas of Oakland. Photo by ARISE students. 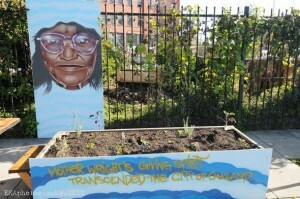 CRP incorporates local heroine Mother Wright with a raised bed garden at the California Hotel in a collaboration with People’s Grocery. Photo by Eric Arnold. For instance, a team of muralists instructing youth from the community to create murals in the city’s most blighted neighborhoods would cost a fraction of the $100,000s to millions of dollars spent on the current abatement process annually. 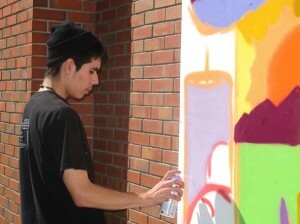 Under a year-round program, murals could be constantly created and maintained in the areas of greatest blight. Funding could be divided between Building Services, DPW, and the Cultural Arts Commission’s cultural fund; data collected onsite could be correlated and shared between these city agencies to allow for maximum efficiency of the mural program over time. This strategy could be reinforced by a program which allows community members and groups to adopt high-blight commercial properties and volunteer upkeep in the same way that medians, garbage cans, and highway sections are maintained, meeting local community needs and enhancing the quality of life by creating public art or garden spaces. Under this model, residents or community groups who adopt the property would be responsible for the costs of creating the art and maintaining it. Engaging the youth is critical in transforming blighted communities and making lasting change. Here CRP artists collaborate with students from Youth Radio. Photo by Desi W.O.M.E. 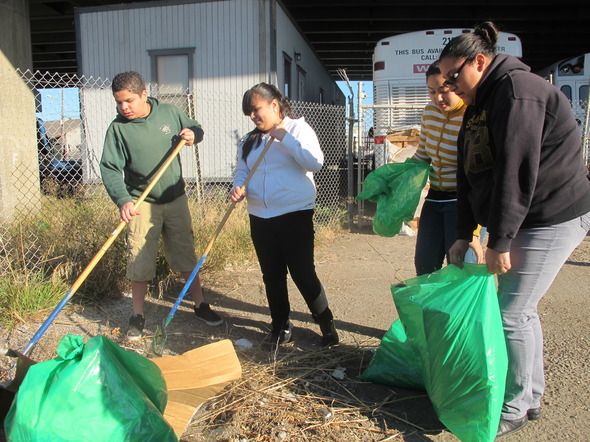 promotes a sense of environmental responsibility and accountability within the local community by making them stakeholders in the neighborhood. For blight reforms to be truly effective, practices must result in actual change in the way things are done. 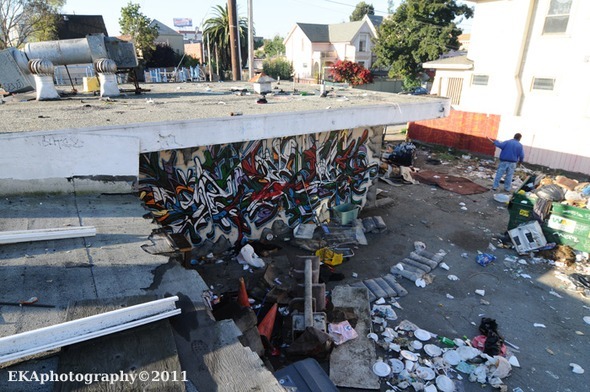 We strongly urge the City Administrator and the blight task force to consider a comprehensive abatement and reduction strategy which could serve as the first line of defense in Oakland’s ongoing battle against blight—while promoting long-term, sustainable, community-based, affordable solutions. A powerful mural makes a lasting difference. Photo by Desi W.O.M.E. For more information about CRP, interviews with CRP artists, or sample images for media usage, contact Desi at CRPBayArea@gmail.com or (510) 269-7840.